Fumi's Fortune Video Slot Review - Casino Answers! Fumi’s Fortune is a 5-reel, 25-line video slot developed by Cryptologic, featuring a wild symbol, scatter wins and a free spins feature. 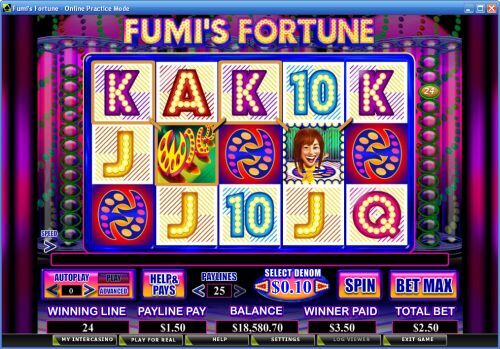 You can play the Fumi’s Fortune video slot at [Americans: Unfortunately due to legal restrictions you are unable to play at any of the online casinos this game is at. We recommend you trying playing the unique slots at Win A Day Casino instead.]. Fumi’s Fortune is a penny slot. Bets on the Fumi’s Fortune slot machine are $0.01, $0.02, $0.03, $0.04, $0.05, $0.10, $0.15, $0.20, $0.25, $0.50, $0.75 and every denomination of $1 up to $20. You can select up to 25 paylines per spin. You can bet anywhere from a penny per spin up to the maximum total bet of $500. The Fumi’s Fortune video slot has a great betting range that is suitable for most online slots players. To play the Fumi’s Fortune casino game, select your bet and press the “Spin” button. To play the Fumi’s Fortune slot game with all 25 paylines enabled, press the “Bet Max” button. The top-paying symbols on the Fumi’s Fortune video slot are the Wild and Aki symbols. If you land 5 of a Kind of either symbol, you will win the 1000 coin top jackpot. The Wild symbol will substitute for all symbols except for the Fumi’s Fortune Logo symbol. The second highest paying symbols are the Fumi and Bubbles symbols, which can pay out up to 750 coins. The Logo is the scatter symbol on Fumi’s Fortune. Scatter wins can occur in any position. You can receive a scatter payout by landing two or more symbols anywhere on the screen. By landing 5 Fumi’s Fortune Logo symbols on the reels, you will win 50X your total bet. After any spin on the Fumi’s Fortune video slot where the Fumi, Aki or Bubbles symbols appear on the reels, you will trigger the free spins feature and win 8 free spins. 1 or more of the aforementioned three symbols will become wild for the free spins feature. During the free spins feature, the extra wild symbol will substitute for all other symbols except for the scatter symbol. During the free spins feature, the extra extra wild symbol can re-trigger the free spins feature. The character will remain the extra wild symbol until the the feature has been completed. All free spins features are triggered randomly. The lines and bet played are the same as the spin that triggered the free spins feature. Try and trigger Fumi’s Famous Free Games when you play at [Americans: Unfortunately due to legal restrictions you are unable to play at any of the online casinos this game is at. We recommend you trying playing the unique slots at Win A Day Casino instead.]! The Fumi’s Fortune video slot has an autoplay mode with advanced settings. You can select up to 999 autoplay spins on the Fumi’s Fortune slot game. You can hit the “Advanced” button to set the advanced settings, such as cumulative win/loss of up to $5,000 or a single win of up to $5,000. You can stop the autoplay mode on Fumi’s Fortune at any time. Fumi’s Fortune is the only video slot we can think of where the free spins feature is random, which is an interesting concept. Because it’s a game show themed video slot, we would’ve liked to see a crazy mindblowing Japanese game show bonus game, but that is apparently not to be. You can play the Fumi’s Fortune video slot by signing up at [Americans: Unfortunately due to legal restrictions you are unable to play at any of the online casinos this game is at. We recommend you trying playing the unique slots at Win A Day Casino instead.]. How can I trigger the free spins feature on Fumi’s Fortune Slots? To trigger Fumi’s Famous Free Games, you have to have a Fumi, Aki or Bubbles symbol appear on the reels. It can be triggered at random on any spin where one, two or three of those symbols appear on the reels. Can USA players play the Fumi’s Fortune casino game for real money? No, American players cannot play this video slot for real money. There are, however, many game show themed slot games that you can play at Vegas Tech casinos like Bovada. 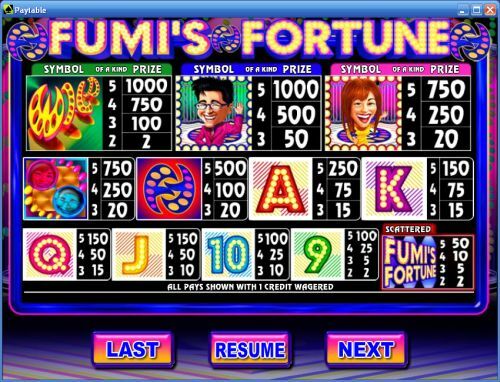 Can I play a flash game of the Fumi’s Fortune slot game in my browser? Yes, you can play a flash version of the Fumi’s Fortune video slot for real money only at [Americans: Unfortunately due to legal restrictions you are unable to play at any of the online casinos this game is at. We recommend you trying playing the unique slots at Win A Day Casino instead.]. If you have issues with the flash casino, download and install the most recent version of Adobe Flash Player for best performance.